Welcome to our third post in the Chasing Photons series, where every Tuesday we will feature one photographer who shares their photography online, using the likes of Google+, Flickr, 500px, or even their own website. Today we are featuring Robert, a 26 year old aspiring professional photographer living in Los Angeles, California. Robert travelled to Haiti after an earthquake which left hundreds of thousands dead. 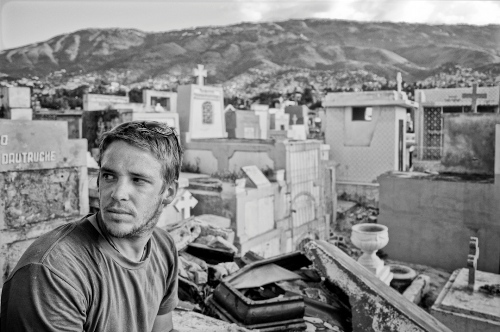 In February 2011, he was able to return to Haiti thanks to a grant from the Gilhousen Family Foundation where he spent two weeks completing his photography project, Waiting for Haiti, a collection of haunting black and white photographs telling Haiti’s devastating story. The project has been submitted to the Exposure 2011 contest, and you can vote for Robert’s submission here. You can check out Robert’s full body of work on his website and his Google+ profile. Nancy Messieh: What’s in your camera bag? Robert Larson: I use a Nikon D7000 with a 35/1.8 prime. Sometimes I rent a 24/1.4 prime which is my favorite lens, I just can’t afford it yet. I have found that the D7000 is potent in low light situations, and is small enough to not draw much attention. NM: Did you study photography or are you self-taught? RL: I have been blessed with some very inspiring mentors. I took a lot of photography workshops, but the main thing I gained from those… were my mentors. If there was a photographer I admired… I would take a workshop with him or her, and get to know them. The resulting long term relationships were what made the workshops worth the money. NM: When/how did you decide to become a photographer? RL: About 5 years ago when I realized that photography was my main joy in life. I don’t have a day job, nor do I have a college degree. I take odd photography jobs as often as I can. My eggs are pretty much all in this one basket. It is scary sometimes. NM: What does photography mean to you? RL: Photography to me is learning through a primarily visual experience, then showing other people those experiences in a way that might educate, or at least make them feel something. NM: Define your photography in one sentence. RL: It is my personal journey through life, as I try to make sense of things that frustrate me. NM: Where do you prefer to post your photos online? Why? RL: Other than on my website… I prefer Google+. I have received more quality feedback on G+ in the last few months than I have on all the other social media websites to date, combined. The way posts are shared, the quality of people using the network, the ease of use, and the non distracting way images are displayed… it works well for me. NM: Where do you love to go to shoot – whether it’s a city, country, or even a specific place? RL: Los Angeles and Port-au-Prince. At night. RL: Photographing in LA is therapeutic… I have a strong love hate relationship with this city, growing up here was wonderful, trying to make it on your own here, as a photographer… not so wonderful. I like to photograph scenes that remind me of why I both love and hate this city. Photographing in Haiti is an incredible challenge. As far as pure visuals are concerned, I enjoy the darkness of the country. It is one of the most mysterious countries I have ever visited. NM: What is the one photo you are most proud of? RL: This is a really hard question, but my gut tells me that of all the pictures… it is one that I took in Haiti of a man named Renaldo. He and I developed a big brother / little brother bond (he was the protective big brother). 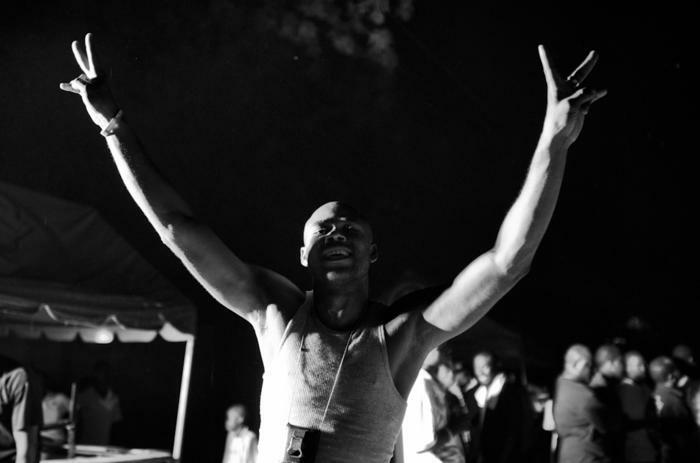 It is a picture of him drunk and happy, with his arms in the air and a huge smile on his face. A couple weeks later he was murdered. It made me realize how important it is to photograph the people you care about, while you can. NM: Who or what inspires your photography? Who are your influences? RL: Movies are my number one source of inspiration. Blade Runner and Saving Private Ryan especially. I used to say that my influences were… Diane Arbus for her mood, Sebastiao Salgado for his subject matter, and Greg Gorman for his black and white style. Back when I obsessed over those three… I was only shooting black and white. Now that I’m doing color as well… Gerd Ludwig should be added. His picture of clubs in Moscow (Moscow Never Sleeps) are very inspirational to me. NM: Where do you stand on the Photoshop issue – acceptable or not. Why? RL: My feelings are… more photoshop, less soul. I don’t like to be distracted by the editing when looking at a picture. RL: Not especially. It is nice to have a drink or two before I start taking pictures. Then when back home editing… I like to be left alone all day with a pot of coffee and good music. Burn away all that ugly day light. NM: What do you listen to when you’re editing? RL: Right this moment, Massive Attack. Which is pretty typical. Tool… Dredge (anything but the new album)… The Ink Spots… Whatever mood the pictures convey is the mood of the music I put on. RL: I give myself time to sort it out and get excited again. Watching movies helps. RL: It is very frustrating to take pictures in Haiti… and also sad. The frustrations come from the situations that I sometimes can not photograph. There are organizations in Haiti doing a wonderful job… like J/P HRO… I would like to photograph examples of progress in Haiti, but sometimes getting access to an organization is difficult. At the same time, I would like to also document the deceit by some of the other large NGOs. For example, I’d like to show people that the majority of their money, when donated to certain organizations, is going to improve the living conditions of the aid workers, not the Haitians. It would be a helpful sight to show people who can’t be there to see it for themselves. My main struggle in Haiti is not in getting access to regular Haitian people… but to the true powers that be. I know enough about Haiti at this point to understand that most of what the American people know about the country is misleading or just plain incorrect. When I compare my experiences in Haiti to what I see on TV at home… it motivates me to continue planning the project. I don’t want to go on a rant and end up typing a full blown synopsis… but I have big plans for this next year. Haiti seems like a microcosm of the way our entire planet operates. I hope to capture that microcosm and show it to people who don’t already understand. That is what Waiting for Haiti is; an attempt to capture that microcosm in photographs. You have to understand a culture or a system before you can start trying to effectively help. Unfortunately, that understanding is not widely had. It was like a very slippery slope. NM: Any advice for aspiring photographers? RL: I am still one of them, I’ll let you know when I can actually lead by example. Keep up with the entire Chasing Photons series here.